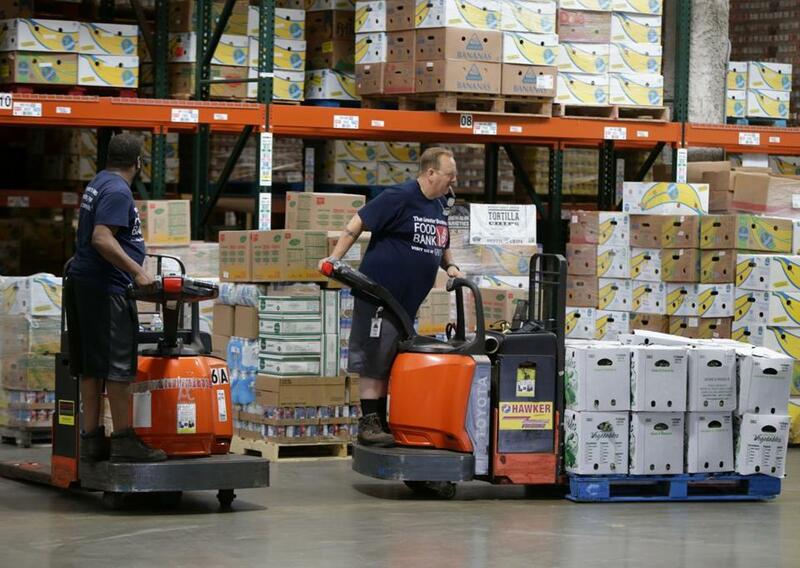 The Greater Boston Food Bank serves more than 140,000 people every month. As a chef on Cape Cod, Joseph Ellia knew that maintaining steady work through a desolate winter would be difficult. After losing his job in January 2012, he tried to support his wife and son, draining his savings while looking for something else. But when his car was repossessed, he knew he needed support. A friend suggested that he visit the Falmouth Service Center, which receives resources from East Boston-based hunger organization Project Bread. He got groceries and took budgeting classes to get his finances into shape. “I swallowed my pride. I had this overwhelming feeling of being welcome. They don’t judge people. They don’t look at people in different ways because of background and race,” he says. Today, Ellia is the executive chef at Falmouth gastropub Bear in Boots. He also serves on the Falmouth Service Center’s board, because he wants to erase the stigma that so often surrounds hunger. We hear these stories at the holidays especially, because they’re celebrations built around food. But hunger is a year-round problem, and it’s usually silent. You can’t see hunger the way you can see a broken leg. And as Ellia says, lack of food is so often equated to lack of resources and savvy: the shame of a lost job, a small salary, inability to make ends meet. Too often, Ellia says, obtaining something as essential as food involves swallowing pride. “People visualize someone who’s homeless or malnourished. But for the most part, they’re ‘us.’ Our neighbors. People struggling to pay grocery bills, and there’s no single community in our state where there’s not food insecurity. In the United States, two-thirds of food-insecure homes have someone working,” says Project Bread president Erin McAleer, who grew up in a food-insecure household on the North Shore, her mother’s finances upended by a divorce. “When you take the cost of an apartment, cost of rent or a mortgage, the cost of child care — which [in Massachusetts] is the highest in the country — you do the math: At the end of the month, it’s groceries that families are really struggling to afford,” she says. According to the Greater Boston Food Bank, one in six Bostonians is food insecure. One in 11 people in Eastern Massachusetts is food insecure, and one in nine is a child. In Suffolk County, two working parents with two children must earn $73,216 a year combined to meet their basic needs. Two parents earning an $11 minimum wage make only $45,760 a year combined. Finances are particularly stretched during New England winters, when heating costs spike. Something has to give. Often, it’s the groceries. And so these organizations make a crucial difference. They serve food, but they also provide something else: dignity and compassion. “This has been the difference between an institution and living independently,” says an elderly woman who relies on Community Servings, which delivers wholesome meals to ill, housebound clients. She asked that her name not be used to protect her privacy. Several local organizations feed people like her every day, every year. Here is what they do, and how you can help. What: At almost 27 years old, GBFB is the largest hunger-relief organization in New England and among the largest food banks in the country. GBFB provides the equivalent of more than 48 million healthy meals annually, distributed through a network of 530 member agencies across 190 cities and towns in Eastern Massachusetts. GBFB serves more than 140,000 people every month. Their goal is to create a hunger-free Eastern Massachusetts by 2028.
Who: GBFB focuses on vulnerable, low-income populations including working families, children, seniors, veterans, college students, and immigrants. How to help: Donate. Every $1 helps provide three healthy meals. Visit gbfb.org/get-involved . 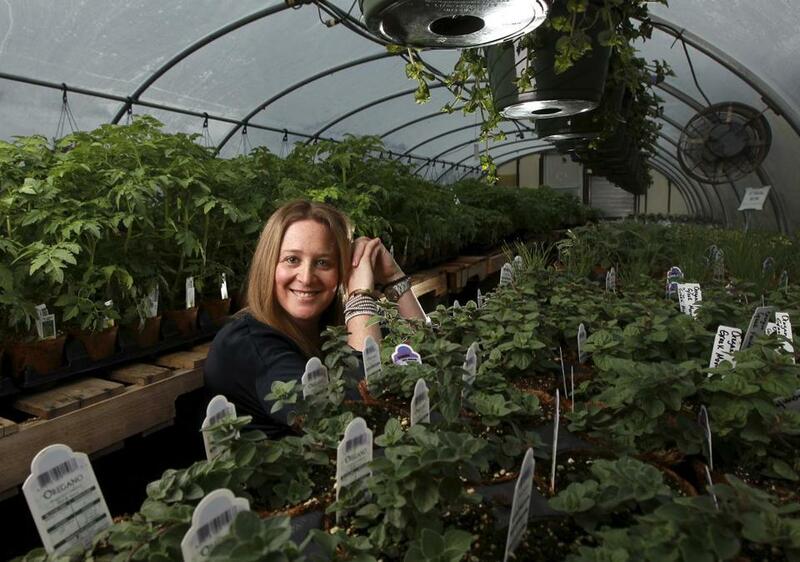 Ashley Stanley, the founder and executive director of Boston-based non-profit Lovin’ Spoonfuls, at Allandale Farms in 2014. What: Lovin’ Spoonfuls facilitates the rescue and distribution of healthy, fresh food that would otherwise be discarded. It picks up 60,000 pounds of perishable food from more than 70 vendors each week — grocery stores, produce wholesalers, farms, and farmers’ markets — focusing on fresh produce, lean proteins, dairy, and whole grains. It has rescued more than 11 million pounds of food since 2010. Expansion plans are in the works for Springfield. Who: Lovin’ Spoonfuls works with more than 140 agencies in Greater Boston, rescuing and distributing food all in the same day. How to help: Join the Friends of Lovin’ Spoonfuls, who work on various philanthropic and volunteer initiatives year-round. www.lovinspoonfulsinc.org/who-we-are/friends. What: This 28-year-old food and nutrition program offers chef-prepared, medically tailored meals to clients who are too sick to shop or cook for themselves and their families. Community Servings offers meals for 15 medical diets. Meals are hand-delivered. “For many patients, the driver is the only person they see on a regular basis. That connection, a smiling face bringing a beautiful meal to someone who feels like the world has forgotten them, is a powerful piece of the puzzle,” says CEO David Waters. Who: Community Servings clients struggle with the activities of daily life: toting a bag of groceries, standing at a stove. Many suffer from cancer, HIV, diabetes, or kidney failure. Medical professionals refer clients; three Community Servings dietitians then approve a diet. “It’s sort of like a prescription. It’s exactly what you need to be eating based on illness, all made from scratch,” Waters says. The group works with 200 referral partners in 21 cities across Massachusetts. There are no financial requirements, but 94 percent of clients live in poverty. Clients aren’t just elderly, either. They range in age from newborns to 102, though most are middle-aged. How to help: “When you’re sick, you’re forced to make choices. Pay for medications, pay for heat, or pay for food. We call it heat or eat; treat or eat. These are choices nobody should have to make,” Waters says. As such, Community Servings welcomes school groups and individuals in their kitchen — prepping vegetables, ladling soup, and packing entrees. www.servings.org. People took off from the starting line of the 50th annual Walk for Hunger earlier this year. What: The anti-hunger advocacy organization focuses on driving systemic change to ensure people of all ages have reliable access to healthy food. It operates a FoodSource Hotline that connects more than 30,000 residents each year to food resources, such as SNAP benefits. It also runs a Child Nutrition Outreach Program in partnership with the Department of Elementary and Secondary Education to increase participation in federally funded meal programs, including the National School Breakfast Program and the Summer Food Service Program. Meanwhile, a Chefs in Schools program brings chefs into school cafeteria kitchens to guide food-service workers in offering nutritious, appealing meals on a public school budget. The program exists in cities such as Lawrence and New Bedford. Who: The group supports soup kitchens, food pantries, community farms and gardens, health center hunger prevention, food rescue, and childhood nutrition programs throughout Massachusetts. The group also provides grants to more than 315 anti-hunger programs throughout the state, including emergency food resources, sustainable farm and garden organizations, and community programs that serve low-income residents. How to help: Participate in the Walk for Hunger, an annual fund-raising event held on the first Sunday in May. 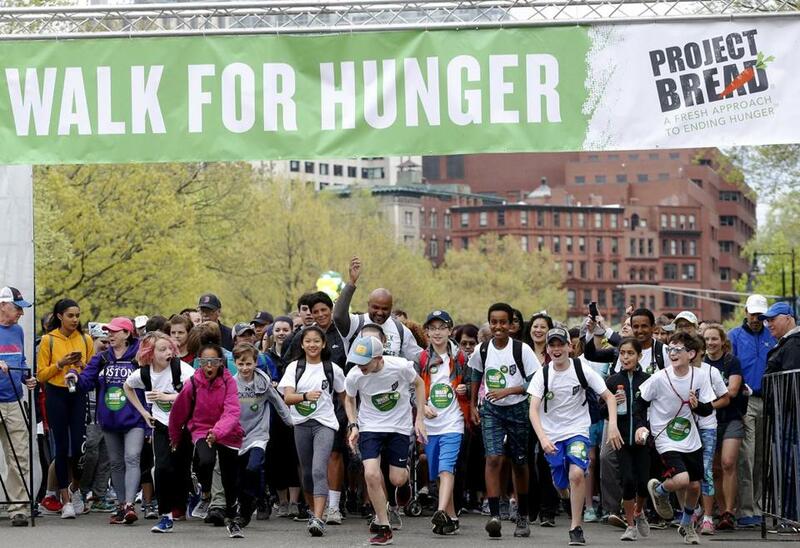 The walkathon has funded 1 billion meals in Massachusetts since it launched — and the 50th walk raised $2.4 million to fund anti-hunger solutions nationwide. www.projectbread.org. Sasha Purpura (center, back), the executive director of Food For Free, and Adam Collins, a driver with Food For Free, picked up food that was leftover from Harvard University's graduation events from the Annenburg Dining Hall at Harvard University on June 4, 2015. What: Food For Free launched in 1981 as one of the country’s first food rescue organizations. Now, it offers a combination of food rescue, farming, and transportation services, providing year-round access to fresh fruits and vegetables. Who: Food For Free distributes food to more than 100 programs in 13 cities around Greater Boston. It also partners with the Cambridge and Somerville Weekend Backpack Program, discreetly tucking two breakfasts, two lunches, milk, and fruit into the backpacks of any student who needs them. It also collaborates with local schools to run monthly farmers’ markets, providing a free, dignified place to shop. Food For Free also distributes thousands of balanced, frozen meals to community colleges that students can pick up before or after class. Recently, a student wrote her a thank-you note. “She said she couldn’t remember the last time she had more than one food group in her meal, and [our program] made her feel like a normal person. We were moved and awakened by that. So many people take food for granted. This college student didn’t feel ‘normal.’ Being able to have a microwavable meal with food groups made her feel normal,” Purpura says. How to help: Food For Free depends on philanthropic donations, says Purpura. But a mind-set shift matters, too. “Understand that this is a significant problem. It exists with your neighbors. People are not proud of being hungry. They are not broadcasting it. You could be working with people who are struggling — don’t make assumptions,” she says. www.foodforfree.org. Most of all, remember how hunger feels. That headache when you work through lunch? The stomach grumble and groan of desperation when you arrive at a restaurant with a two-hour wait? Thousands in Massachusetts harbor those feelings every day.